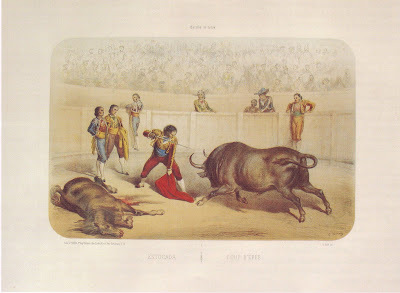 BOOKTRYST: Catalonia Bans Bullfights, Doré Says "Bull"
Hemingway is turning in his grave. 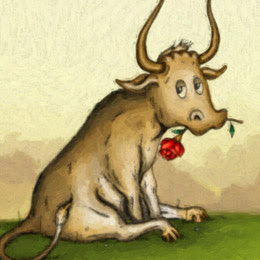 Ferdinand the Bull is relieved. The Spanish province of Catalonia (which includes the capital, Barcelona) has joined that other Spanish province, the Canary Islands, which outlawed it in 1991, to ban bullfights, effective 2012. Bullfighting has ancient roots. It was a popular spectacle in ancient Rome but it was in Iberia (ancient Spain and Portugal) that the blood sport flourished and developed. 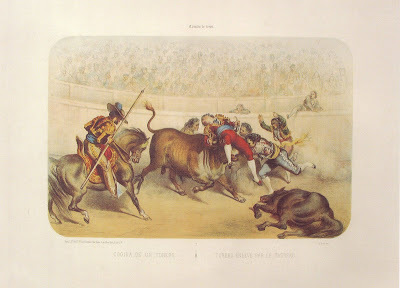 After their conquest of the peninsula, the Moors changed bullfighting significantly from the brutish gorefest practiced by the conquered Visigoths to a ritual observed in connection with feast days; the conquering Moors, mounted on highly trained horses, confronted and killed the bulls. 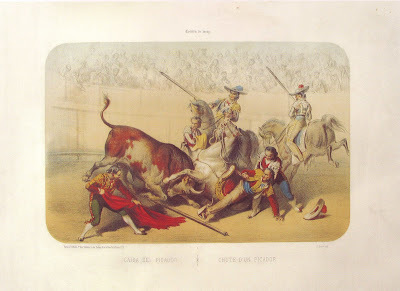 As bullfighting evolved, the men on foot, the toreros, who assisted the horsemen, began to become stars in their own right and the modern bullfight began to take form. In 1726, Francisco Romero of Ronda, Spain, introduced the estoque (the sword) and the muleta (the small, more easily wielded worsted cape used in the final act of the fight). 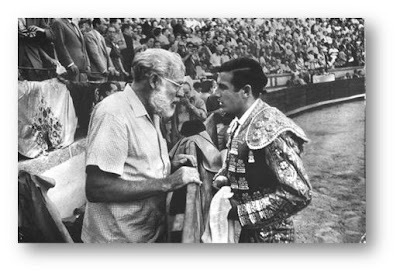 Romero de Ronda founded a bullfighting dynasty and the modern era of bullfighting began. 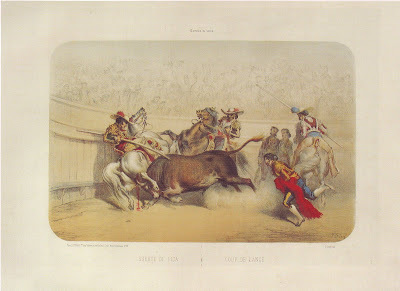 And Gustave Doré chronicled it, c. 1860, with a series of six dramatic lithographs that should impress even the most vociferous critics of the blood sport. In Corrida de Toros, Doré captured the strength and movement of the bull, the tension, the danger in the ring - it almost seems as if the bull has a chance, not just at survival but of actually conquering the men on foot and horseback who are supremely annoying it to rage. 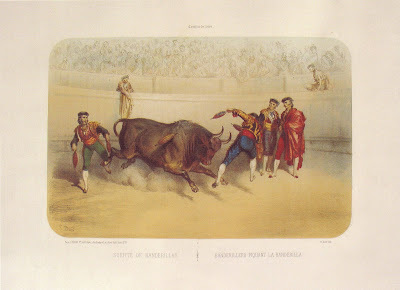 The ignominy of the sport is made noble, primarily because Doré appears to sympathize with the bull and the tragedy of bullfighting rather than the glory of the fighters. Number II: Suerta de Banderillero - Banderillero piquant da Banderilla. 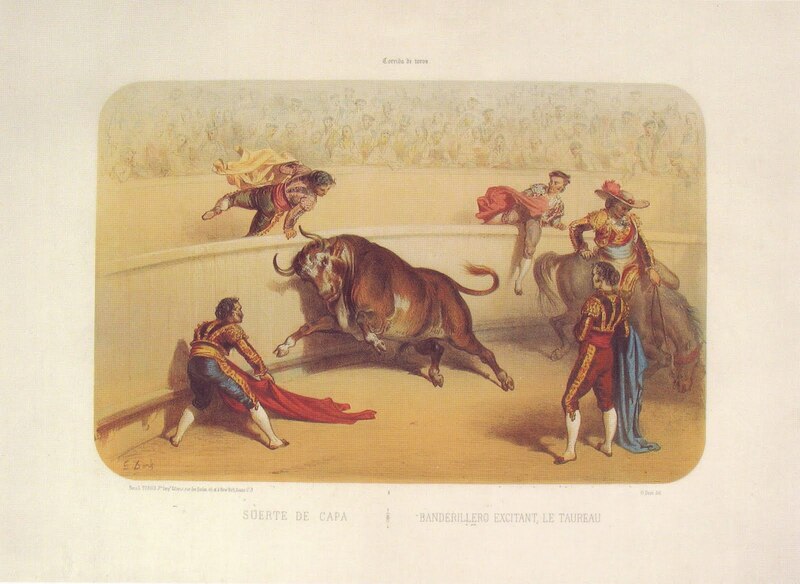 Number III: Suerta de Capa - Banderillero excitant le taureau. Number IV: Cogida de un Torero - Torero enlevé par le taureau. Number V: Suerta de Pica - Coup de Lance. Number VI: Estocada - Coup d'epée. It is all, ultimately, sheer folly. If I had guys poking lances into my landscape while teasing me, I'd lash out, too. The guy with the sword? Dinner. 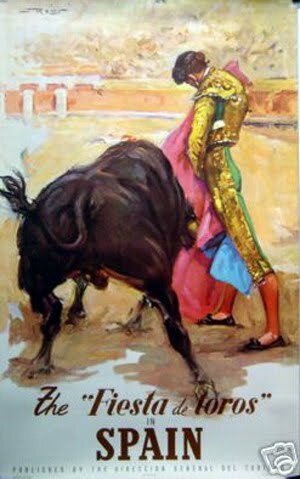 I have nothing against the torero but I always root for the underdog in this non-contest where the denouement is almost always a foregone conclusion. DORÉ, Gustave. Corrida de Toros. Paris & New York: Turfis & Duane, n.d.[ c. 1860]. Six original color lithographs, heightened with gum arabic. Sheet size 380 x 550 mm. 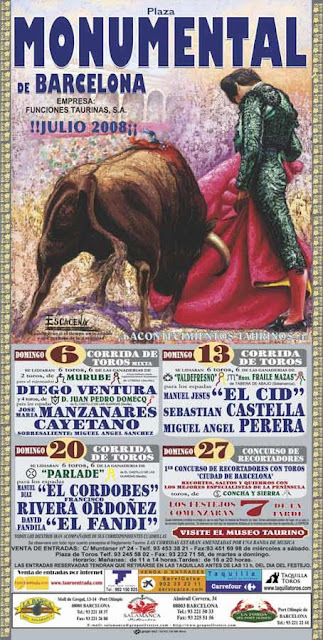 Vindel (Estampas de toros; 1931) n°26; pl. 167 à 172. El siglo de oro de la Tauromaquia (1989) p. 168. n° 176. Images of this extremely rare suite courtesy of Sims Reed Rare Books. No manner of illustrious illustration can make this a sport. Not when the bull has no where to go! Did it survive from Roman times because it "only" featured a dumb animal? Gladiator events didn't make it! Good take on the subject!